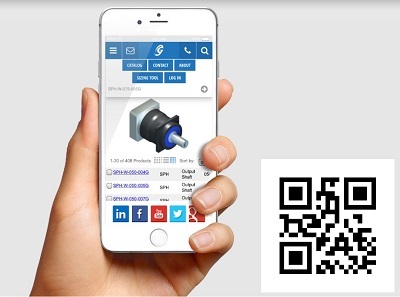 Mount Prospect, IL – May 27, 2015 - GAM, a manufacturer of high precision gear reducers, servo couplings, and linear mounting kits, launches a mobile web app. The mobile app, optimized for both smartphones and tablets gives engineers quick access to full product information anytime, anywhere. Users can browse the entire product catalog, search by keyword or part number, and then narrow down the results based on specific criteria. To assist the product selection process, a side-by-side comparison feature is available. The mobile app also includes an easy to use Sizing Tool that helps users find the right product compatible with their servomotor. Once a product has been selected, users can request a quote or email the information to a colleague for design review. The email contains a link to CAD models, full product information, and .pdf catalog data sheets. Additional functionality was built in specifically for GAM’s sales channel, giving representatives and authorized distributors the ability to price and quote customers instantly. The GAM app is browser based and works with any smartphone or tablet connected to the internet. It does not require download and updates occur automatically, ensuring users are viewing the most current information available. To use the app, visit m.gamweb.com or scan the QR code in the image.